Tarrel pried the key from the mummified corpse’s fingers as he knelt in the cobbled alley. Keys protected things you could trade for food in the market, and he had lived off the bazaar’s trash heaps for days. All he needed to do was learn what the key opened. The dead man was likely killed by magic to be mummified like that. He wore a blue vest and black breeches, the uniform of one of the minor merchant houses up on the hill where rich people lived. He saw the upper crust visitors in the market most days and had learned a small handful of them would toss a copper his way if he groveled as they expected. The face of the corpse was too shriveled to recognize, but the house colors told him where he should go to check for matching locks. If this worked, he could keep himself fed for weeks, or even months before they caught on. The key was cast iron, with a flat round handle bearing a single line engraved across its middle. Tarrel wasn’t an expert at such things but recognized it as an elemental symbol, a symbol of power sacred to the temple priests. Tarrel wasn’t about to give up his prize. This key was the best bit of luck he’d ever come across. He sprinted out of the dirty alley and into the colorful stalls of the market square, the heart of the bazaar. Merchants hawked goods from tents and tables scattered about with no rhyme or reason. Two quick turns through the narrow paths put him at a good vantage point, so he dodged around a cloth vendor’s stall and stopped to look back. His pursuer ran out of the alley and looked around, the expression on his face sour enough to curdle milk. The man’s yellow long-tailed jacket marked him as from the powerful House of Orchids. “Out of my shop, waif!” The old hag who owned the booth kicked him in the backside, propelling him out into the open as the yellow jacketed man turned to look. After a few turns through the market square, he headed into one of the alleys wide enough to support a row of vendors along one wall. The path constricted as he passed a collection of food stalls, the aroma of roasted meats drawing a growl from his empty belly. Left, right, right, and left again put him at a small well in an alcove too small for a vendor stall. He collapsed and drank in great gulps, not caring that animals also drank from the murk. The water was dirtier than normal, but it still refreshed him. Tarrel listened for cries of alarm in the distance but heard only the everyday sounds of the market. He’d made it unless the man had seen him well enough to describe him to the city guards. How far would Yellow Jacket look? He chewed his lip. Should he run farther? He opened his fist and looked at the key in his dusty hand. What kind of key would be important enough for two houses to want it? The odds of the key belonging to the corpse’s household dropped in Tarrel’s mind. A pocket of coins in exchange for the key might reduce his chance of the two houses hunting him down. That was it. He’d just have to visit his usual pawn, a man by the name of Skinny, to see if he could sell it for enough money to last a few days. Maybe even weeks if he was lucky. He’d have to hide to keep his coins, but he knew how to stay out of the way. Tarrel avoided everyone’s eyes as he eased his way toward Bank Alley, one of the less reputable side-streets where people didn’t ask questions. They weren’t bankers like those in the city core, but they were the poor man’s source of coin, and could broker shady trades. Skinny was fair with him, at least most of the time. The fastest path to Skinny was back out through the fringe of the market square, so he kept his eyes peeled for Yellow Jacket as he wandered through the vendors who had everything he could ever want or need, if only Tarrel had the coins for it. The scent of cooking foods, the bright colored banners and tents, and the noise of haggling was home to him. “Hail, Tarrel.” It was Severn, the tinker. Good for the occasional copper coin for running errands. “Goodman Severn. Any errands to run today?” If he failed to check in with everyone, it was his own fault if he went hungry. Three! That was rare good fortune. Everything seemed to be going his way today. “I’ll be here when you get to your tent in the morning.” Tarrel waved goodbye. He’d gotten into the good graces of a handful of vendors by doing odd jobs for them in exchange for the occasional copper or chunk of bread. Only when he was on the verge of starvation did he resort to theft. He had to rely on the good graces of the market vendors, or he would starve. He’d die for sure if he were branded as a thief and expelled into the surrounding desert. Tarrel sweat under the hot sun, but it dried without cooling him. Indecision between begging Goodman Severn for water and heading to the bank held him for a moment, but Bank Alley was a path forward to achieve his goals. Water could wait for a few minutes. Most people ignored the market’s underbelly without so much as a glance. It could be dangerous to those who didn’t know their way around. The plan was as clear as it was simple. He’d pawn the key to Skinny, buy some food that hadn’t already spoiled, and then hide out until morning. A hand clamped down on his wrist. “What have we here?” One of the city guards held him in a vice-like grip and lifted Tarrel’s hand to look at the key. The guard’s red-plumed steel helmet had small metal wings swooping in from the side to cover his cheeks. They were easy to spot as a convenience to the shop keepers. Tarrel saw guard plumes as something to stay clear of, but his new treasure had distracted him. “What’s the likes of you doing with a fancy thing like this?” He pulled the key from Tarrel’s hand. They always assumed he’d stolen whatever he had. The guard pulled on Tarrel’s wrist to haul him along but had loosened his grip. Tarrel twisted and ducked, pulling his hand free. The guard made a grab for him and missed. The guard still held the prized key, but Bank Alley was right there as an easy escape. The guard wouldn’t follow into the alley, at least not without four or five armed friends. He made it to the first turn and glanced back. The guard stood outside the alley scowling at him. Tarrel grinned and waved, and continued around the corner. He climbed a ladder and ran across the roof back to where he had a good view of the open market and watched the guard trudge over toward the alley and the body. The guard tapped the key in his other hand as if thinking something over as he walked. Tarrel had his own thinking to do. Had Yellow Jacket killed Blue Vest back in the alley? Were they both after the same thing? Maybe the key was a rare treasure, and he was the one who could have solved a great mystery and stepped in to save everyone. They would shower him with gifts and praise, and he would become rich beyond his dreams. No, dreams were useless when day-to-day survival was at stake. The key was gone and with it were gone his hopes of an easy score and a meal. At least he had some jobs that would feed him tomorrow. If he hustled, he might find a job with one of his favorite vendors before dark, or maybe he could become friends with someone new to add to his list of odd-job clients. There was plenty of afternoon left. He scaled back down the ladder into the alley. As he stepped off the low rung onto the trash-strewn paving stones, he felt a knife poke into his back. “You’re a lot of work to track down, boy. I don’t like that kind of work.” The voice was familiar. Yellow Jacket. Yellow Jacket was now bound to either admit he had lied, or make good on his promise. Or he could kill him and find the key himself. Tarrel wasn’t sure which was more likely. If he was offering a sovereign, the man was desperate, and in a rush. He may have sounded calm, but Tarrel knew better. “Clever little beggar, aren’t you? Sure, I’ll play it your way. Come with me.” He set off at a fast pace and forced Tarrel to jog to keep up. They stopped three alleys later in an area of the underbelly he didn’t know. Yellow Jacket rapped on a door. Yellow Jacket held up a hand to cut him off, then jerked his head in Tarrel’s direction. “I need to paper-swear a deal. One sovereign in exchange for a specific key, within the next hour. I have a drawing of it.” He handed over a gold coin for Tarrel’s payment, and a copper to pay for the enchanted paper. The doorman pocketed the coins and let them through into a windowless room illuminated by oil lamps. The banker looked up from his worn oak desk, then pulled a sheet from a stack and stamped the paper three times with a seal, with a brief flash of blue light at each impact. He cut the paper into three pieces. One went to Tarrel to bring in with the key. The next went to Yellow Jacket. The third he wrote on and filed away in a box. Anyone who broke a deal after paper-swearing would be black-listed. It was never good to cross the bankers. The piece of paper wasn’t a guarantee of safety, but it was better than nothing. The bazaar was as lively as ever as he returned to the central plaza, the crowds unaware of the life-and-death drama playing out. First, he checked the alley where the whole thing had started. The body was gone, and no guards were about. That meant his target would be at the central market outpost, or he would be out patrolling. He climbed an exterior stair at the edge of the plaza and looked around for the guard’s telltale red plume. He saw nothing, which was unusual. At least two or three would be in sight most days. The usual vendors and customers milled about, along with priests from the temple in groups of two and three. They always shopped on Saint’s Day, still two days off. Had the unusual death triggered a larger hunt? Maybe they were after the key, too. There was a chance he could get the searchers on the tail of Yellow Jacket, but it might backfire and ruin all his plans. If everything worked out, he could find and deliver the key, get paid, and if Yellow Jacket didn’t come to collect, Tarrel could pick the key up later as well and sell it a second time. He had so many ways to win that he was able to ignore the many ways he could lose. There was nothing left to do but to check the shack in the center of the market where the guards took complaints and stored emergency supplies. A few minutes of dodging through the market brought him to the door. It was open, which meant someone was inside. Tarrel peeked through the door and saw the telltale helmet, still worn by the guard. He sat in a chair at a small table, facing away from the door. A clay pitcher sat on its side on the table beside him. There was no way to sneak in without being seen. If the guard had the key on him, it would be impossible to retrieve. If he’d put it away, there was no way Tarrel could be quiet or stealthy enough to look for it unless the guard was asleep, and they never slept on duty. He looked closer. The guard’s red helmet plume tipped forward. Maybe this was the miracle he needed. He crept in, looking for any box or drawer capable of holding the key. Crates lined the walls, but they were all sealed. He crept around in front of the guard. Maybe he had it on him. Tarrel wasn’t sure he was up to taking a key from a sleeping guard. It was the stuff of rogue stories told around the hearth, not something he ever expected to do himself. The guard’s helmet tipped farther forward, came off, and crashed to the ground. Tarrel jumped, then took two steps toward the door as he glanced at the guard, expecting him to yell and give chase. Tarrel stopped, horror filling his heart. The guard was dead. Shriveled like Blue Vest, with dry skin stretched tight across bones. One hand held a mug next to the empty clay pitcher on the table, and the other hand held the key. Two men were dead, both by the same magic. Tarrel only knew of one thing in common between them: The key in the guard’s hand. He’d been there to discover both bodies, so things might not go so well if another guard showed up while he was gawking at the shriveled corpse. Tarrel grabbed the key, then set it back down. Why hadn’t it killed him before? It didn’t kill immediately, so maybe he hadn’t held it long enough. He glanced at the empty pitcher and mug. Water. He’d become horribly thirsty while carrying it. He got out a small leather bag, the kind he stored coins in when he had any. He dropped the key into the bag and tied it closed, and looped the ties through his rope belt. If he got thirsty again, he’d throw it away and run, forget about the gold sovereign, and pretend the whole day had never happened. Tarrel crept back outside and marched toward Bank Alley. He passed a small public pool fed by a well near the guard station. Tarrel didn’t feel as thirsty as he had before, but it wouldn’t hurt to stock up and drink whatever he could. There was no harm in taking extra precautions. Was this all tied together somehow? It had to be, but how? Tarrel’s mouth began to feel dry, he hoped from fear. He walked farther and noted that many of the vendors had hidden away their drinking water, hoarding it now that they couldn’t refill their containers. Stale-smelling dust blew in little swirls through the market. The crowd bunched into huddled conversations away from the wells and the pool, worry clear on every face. The haggling died down, and people left the market in a continuous stream, filling the streets beyond. The priests were not leaving and were more visible now than before. Tarrel stopped to watch a trio of priests as they faced each other in quiet conversation. One held a string with a small piece of metal hanging from the end, while the other two chanted, then clapped. The little bar spun, then stopped dead still. They’d made a finder to track something. One of the priests sighted down the little bar and looked straight at Tarrel. “It’s that way.” He pointed at Tarrel, then took two steps forward. The first time Tarrel dodged through the market, it was fun. The second time, it was work. Now, he ran as if demons were on his tail. Yellow Jacket wanted to kill him. He was sure the guards would blame him for two deaths. He would be hung, not just sent to the desert to die. The priests? Who knew what they wanted, other than to chase him down and get the key, just like everyone else. At least they might not want to kill him as a first option. His one hour would be up soon, and the priests on his tail could track him with magic. He wasn’t going to make it to the banker without leading everyone to the same spot, a sure recipe for disaster. All he knew was that if the adults all fought over what he had, then he would be the one who lost. Tarrel glanced back and saw that pairs and trios of priests were headed in his direction, trading hand signals across the square. He would need to leave the open area to lose them. He may even need to get clear of the whole bazaar to get out of the range of their tracker. If he had a little time to think, he might be able to figure a way out of his troubles. He climbed a stair and headed across the rooftops where there were no crowds. It was easy to jump over the first few alleys because they were narrow. Some gaps even had small bridges or boards laid out. Tarrel got a running start to jump a larger gap and rolled as he landed on the far side. A bell tower promised a convenient lookout, so Tarrel climbed a ladder leading from the roof to the upper tower and looked back. Most of the priests had remained at ground level, and the few on the roofs were hard pressed to keep up and called down into the alleys to their friends. Jumping from roof to roof in a priest’s ankle-length gray robe was challenging at best. Tarrel gave the rooftops and the square a quick scan. Drawing everyone to the bank was still not an option. If he hid the key, the priests would find it and take it. If he kept it, he risked turning into a leathery husk. If he gave it away, who was the real owner? Blue Vest? Probably not, since he didn’t know how to handle it and had died. He tried to spit in frustration and came up with a cottony mouth. Maybe he needed more wrapping around the key, or to keep it farther from his body to avoid a shriveling death. He had no idea how any of the magic worked, so he guessed, with his life in the balance. Was Yellow Jacket the real owner of the key, along with his house on the hill? Tarrel doubted it. Even if he was, Tarrel didn’t like the man. He was dangerous and had made casual death threats. 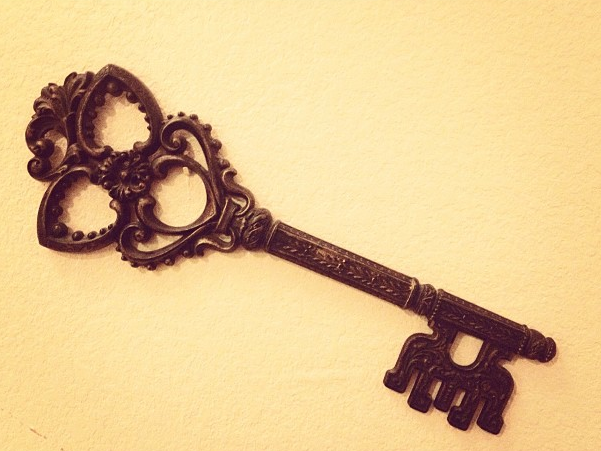 If the key had been his, Tarrel didn’t want him to have it back. It hadn’t belonged to the guards, so that left either the priests or someone who wasn’t chasing him yet. The plan had seemed so simple earlier. “You know, it would have been easier to take the key back to the bank for me.” Yellow Jacket came out from behind the corner of the tower and drew the dagger he had poked Tarrel with earlier. Tarrel started at the sound and fumbled on a ladder rung. He reached out to the bell’s long pull rope to steady himself. “I was going to go right back, but I ran into trouble.” How had the man found him? “Don’t bother with excuses. Reasons don’t matter. I’m just here to get the key.” He held out a string with a tiny rolled up paper dangling from it. The paper spun to point at Tarrel. He’d used the paper-sworn contract to make a tracker like the one the priests used. The papers were all part of the same magical contract and had an affinity that made the link possible. Yellow Jacket might not be able to keep up in a race through Tarrel’s home turf, so he prepared to jump down to the rooftop and sprint once more. Two other men in yellow jackets came out from each side of the tower, blocking his best escape route. Tarrel had to stall, had to somehow make the man talk instead of act. In the distance, Tarrel saw the rooftop priests as they made their way nearer at a quick pace, with only an occasional glance his way. Tarrel grinned. Yellow Jacket and his thugs weren’t looking back and didn’t know the priests were closing in. Maybe it wouldn’t be so bad to have everyone in one place if it gave him a chance to flee in the confusion. Tarrel kicked the ladder away from the wall and climbed the rope hand over hand toward the belfry. The bell let out a deep note which echoed back from the far side of the open plaza in the distance. The note repeated with every pull as he climbed until he stood on the edge of the belfry looking down. Below, Yellow Jacket’s men grabbed the ladder and hefted it. Soon it would be back in place. Where were those priests? Tarrel flipped the rope around the outside of the pillars at the top of the tower, winding the rope around the outside as the men below worked to replace the tall ladder. Tarrel glanced below as one of the men in yellow let out a yelp. Finally, the priests had arrived, jumping the gap from another building, and climbing an exterior trellis on the side of the building with the bell tower. The priests brandished clubs. An angry Goodman emerged from a door built into the base of the tower. He held a staff and seemed eager to teach a lesson to whoever had rung his bell. He stopped, dumbfounded at seeing almost a dozen men on his roof, and Tarrel up in his bell tower. Good. The more chaos, the better for his escape. Yellow Jacket, now named Rogan by the priest, charged into the fray with his knife out. Tarrel only saw one chance to get past them. He held tight to the end of the rope wound around the tower and jumped, swinging in a great expanding arc over the rooftop, then over the alleys as the rope unwound from the tower. The bell rang again as the rope pulled tight as it unwound. At the rope’s full extension, Tarrel found himself flying over the alley at rooftop height, the wind blowing through his dusty hair. He heard clangs and grunts from the roof but didn’t dare take his eyes off his path. He let go and dropped into the alley to avoid crashing into a wall. The ground rushed up, and he landed in a roll. His sandals flew off, and he skidded to a halt face-down on the dirty cobbles. The fall knocked the wind out of him, and he hurt all over. Tarrel couldn’t breathe well enough to speak, so he nodded. The woman helped him to his feet. She was another city guard. It was no use. The guard wasn’t listening. There didn’t seem to be a way to change her mind from believing the priests were out to cause trouble. From what Tarrel had seen, the priests were the ones trying to restore order, and everyone else was messing it up. The guard spit on the ground. Tarrel considered handing the key over to see what happened to her. No, he wouldn’t condemn the woman to die in such a horrible way. She was just doing her job, even if she was doing it wrong. They came out into the city’s central plaza. At one end was a building that housed the central city guard, apparently where the guard headed with Tarrel. In the center stood a reflecting pool, dry now. The palace overlooked the pool from the side. At the other end of the plaza was the temple, its ancient facade of carvings and columns a statement to the dedication of those who followed the Old Religion. Across the top were the four elemental symbols. One of them matched the symbol on the key. Water. Behind them, people poured out of the roads and alleys into the small plaza. Priests, priestesses, guards, Yellow Jacket and his men, and even a handful of men in blue vests. The guard turned to look, and Tarrel ran for the temple. The guard grabbed him by the shoulder but ended up with nothing but her cloak as Tarrel shrugged it off. Yellow Jacket and the other men just yelled as they closed in on Tarrel. The temple doors opened, and a priest in a gray robe looked out at the horde running toward him, his eyes wide. He turned to yell back into the building as Tarrel approached in the lead. It was hard to keep track of who was yelling what. Tarrel skidded through the door and glanced back. Others tried to shout him down as they all ran forward. The priest at the door gawked for a moment and said, “Keep running down the main hall. Tell the High Priestess.” He heaved on the door in an attempt to cut off those chasing Tarrel. Tarrel was slowing, and his breath came in loud wheezes. He shouldn’t be this tired yet. He hadn’t run that far. It had to be the key. Toward the back of the temple’s main hall stood the High Priestess of Earth, her white robe a bright contrast to the stone walls mottled by beams of light filtering through a row of tiny windows. Her white hair was tied back with a silvery cord. Her robe showed an embroidered earth symbol on the front, a circle divided into four quarters. Tarrel fumbled with the pouch containing the key and held the pouch out to her. Behind him, the entry door crashed open, and men poured into the temple hall. She stepped past him and stood in the middle of the hall, her arms spread wide as men continued to tumble in through the door. She was either the most powerful person in the room or the most foolish. The key felt rough in his hand, and his fingers had trouble closing on it. At least the key had not turned him all the way into a dry husk yet. Maybe keeping it in a bag had saved him from that fate, but it was still sucking him dry. He skirted the stone altar with its sermon books, cups, and candles, and he stumbled for the arch. Men’s voices raised in alarm as all their weapons clattered to the ground. As Tarrel stumbled through the arch into the sanctuary, he heard the High Priestess say, “Be seated.” He felt the earth tug at him even in the sanctuary, well out of her sight. He forced his way forward despite the pressure as he heard men grunt and crumple to the floor behind him. The far side of the sanctuary had four doors, each with an elemental symbol above the lintel. The water door was ajar, so he pushed it open and stepped through into an unlit foyer. A short granite pedestal jutted from the center of the floor. A fresh breeze with the scent of pine washed over him. Dim light filtered through the door behind him; it was enough to see a keyhole in the middle of the pedestal’s flat top. He fumbled with the key, but his fingers didn’t want to work. He used his off-hand to pry his fingers away from the key, then pulled it loose. He slid it into the keyhole with a clink. The key turned of its own accord, and the pillar began to glow as it thrummed a deep note, more felt through his bones than heard. Water flowed nearby. He felt it flow through him and because of him. He was the water. The floor rushed up to meet him as he collapsed into unconsciousness. Tarrel’s eyes were sticky. He rubbed and opened them, only to see the High Priestess of earth along with two others in white robes and several priests in gray. He lay on a mattress softer than any straw tick he’d ever managed to find or build. The room had an open balcony across one wall. On the other side of the room stood the short keyed pedestal and the door back into the sanctuary. Outside the balcony, he heard a waterfall and saw birds circling and flitting from tree to tree in a verdant expanse. Tarrel said, “Including from people.” He held up his hand and noted the new pink skin where the magic of the key had damaged it. Tarrel felt water flow through channels built into the floor. They aligned with the portal, and water moved freely into the city on the far side of the portal. He looked down and saw he wore a white robe, but with the water symbol embroidered on it. The other two white-robed visitors were the High Priest of Fire with an empty circle on his chest and the High Priestess of Air bearing a circle with a point at its center. Their complexions showed none of the wrinkles of the High Priestess of Earth, but their expressions bore an ageless grace and maturity. He looked again at his own robe with its water symbol. They couldn’t expect that of him. He said, “No. I won’t do this for you. I can’t.” He sat up, experimenting to make sure he wouldn’t collapse again. He felt weak from several days of fasting. The High Priestess of Earth spoke again, having taken on the role of speaker for the group as the eldest of those in white. “It’s not us who will make you stay or go. None of us could, for long. You are quite young, after all. So much pent up energy to spend and the power of water serving you.” She smiled. Tarrel eased his legs over the edge of his bed and put his feet on the floor. The surface was damp, with beads of water scattered across the floor. The beads ran together and gathered at his feet. As the water gathered, it sang to him. It filled his mind with images of rain, rivers, and movement. He felt the city through its aqueducts, all the way to every well and pool. His eyes brimmed with tears at the beauty and wonder of it all. The water of his tears danced for him like the water running through the city as fountains dormant for decades revived and celebrated with him, and for him. He was the lifeblood of the city.